Duke paints on discarded windows he salvages or that people give him. Applying paint to the back of the piece of glass he works in reverse of the conventional method, starting with dark lines and highlights first and adding background layers last. Duke is also a multi-instrumentalist and poet and one of a fast fading breed of San Francisco street artist and maker. Absolutely amazing. I’ve shared this on my F*cebook page. I bought one of this guy’s paintings years ago when he was parked at the corner of Washington Sq. Park. Been looking for him ever since to maybe get another painting. Thank you for showcasing this talented artist! Will have to give him a call…. Many thanks for the kind words, it is appreciated. Thanks for the story and the comment, Duke sends his best. Duke – One of my paintings broke over the weekend and I need to replace it asap! I sent an email with the stuff from your blog that I particularly like. I’m hoping I can come by sometime in the next few days. Thank you! 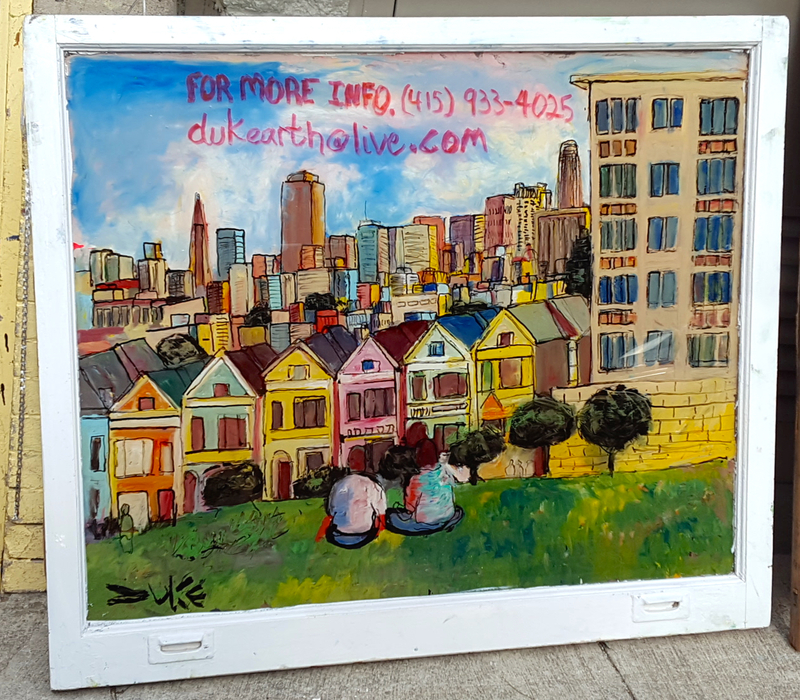 Duke’s paintings are on sale today at the Alamo Square Park Flea market – part of Sunday Streets.